Frances Auretta Fuller was born in 1826 in Rome, New York. The Fullers relocated to Wooster, Ohio in 1839, where Frances was educated in a girls' school. Frances and her younger sister Metta started writing and publishing stories and poetry - first in local newspapers like the Cleveland Herald and Sandusky Daily Register and later in the New York Home Journal, a popular literary and arts magazine. Mary Virginia Terhune (1830–1922) was an American author of novels, short stories, biographies, travel narratives, cookbooks and domestic manuals whose career stretched across seven decades. She began her career writing articles at the age of 14, using various pen names, until 1853 when she settled on Marion Harland. Her first novel Alone sold more than 100,000 copies. Born December 21, 1830 in Dennisville, Virginia, Mary Virginia Hawes was the third of nine children born to Samuel Pierce and Judith Anna Smith Hawes. Terhune was home schooled until 1844, when her family moved to Richmond, Virginia, where she attended a girl's seminary school for two years of formal education. Elizabeth Fries Lummis was born October 18, 1818 in Sodus Point, New York. Her mother was Sarah Maxwell Lummis, daughter of Revolutionary War captain John Maxwell, who was lieutenant of the first company raised in Sussex County, New Jersey. He later joined the army of General George Washington as captain of a company of 100 volunteers known as Maxwell's Company. 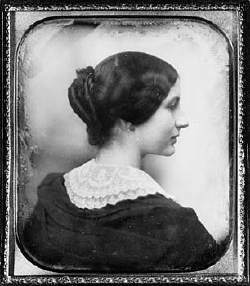 Anne Lynch Botta was a poet, sculptor and salon hostess in the mid-to-late nineteenth century. The most well-known writers, actors and artists of the era were among the creative people who attended the gatherings Botta held at her home in New York City. Edgar Allan Poe read his early drafts of 'The Raven' there, while Margaret Fuller and Ralph Waldo Emerson discussed transcendentalism. Though she died very young, Matilda Hoffman made such a deep impression on the young American author Washington Irving (The Legend of Sleepy Hollow) that he mourned her passing for the rest of his life. Decades later, the mere mention of her name left him speechless. Sarah Matilda Hoffman was born in 1791, daughter of Josiah Ogden and Mary Colden Hoffman. Matilda, as she was known, grew up in Manhattan and Albany, New York. Her mother died when she was six years old and her father married Maria Fenno five years later and began a second family. Maria was only ten years older than Matilda.